PUT YOUR LIFE ON CANVAS! Your number one resource for putting your artwork on canvas. 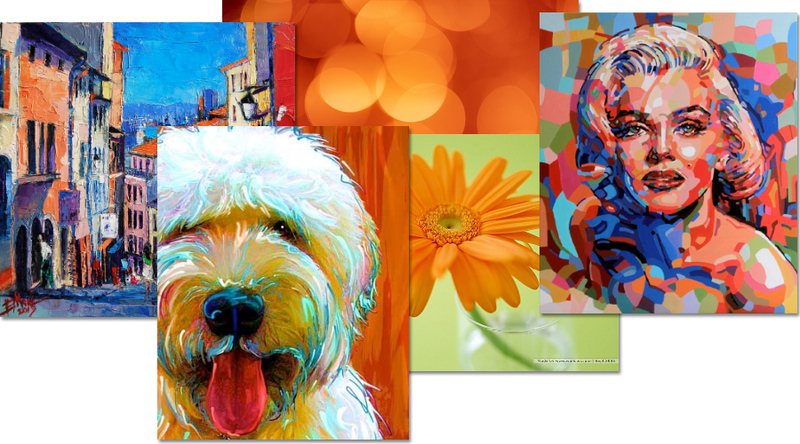 Print your artwork on regular canvas or go wild with a canvas featuring metallic or aluminum surface. Choose a file that you want to use for your canvas. Browse to your device, the cloud or where ever you store your images. Try not to use a low resolution image. Start with your canvas options. Choose between canvas, aluminum or a canvas with a metallic surface. Choose a thickness and edge, then submit your order. Once you submit your order, you’ll receive an email with your order details. We’ll get to work, print your canvas and ship it to you or you can pick it up at our store. Thank you! The canvas was presented to the principle in front of the entire school community. The response from staff, PTO leadership, parents and principle was fantastic. The PTO president was so happy and the principle found me that week to say how much he truly loved the canvas! Thanks again. The canvas turned out great. We are very satisfied with it. We placed it in a beautiful frame and its displayed in our entryway. To rate the canvas; 5, and yes, I would recommend your business. Yes Yes I would sure tell my friends.... I do tell my friends! You do some amazing work Canvas One. Keep up the good work! Thank you. Our company has been working with CanvasOne for a few years now and have always been impressed with the results. Recently I had CanvasOne print over 30 fine art photographs for a local medical office - they looked amazing. Not only have I used CanvasOne for my clients but have also had a very special image printed on canvas for my home. The Canvas is beautiful and we have received MANY compliments on it. Thanks for your excellent work!! I really appreciate your work and attention to quality and detail. Local Business. You can pick up your canvas when its ready. Personalized service to make sure your canvas is right. Premium quality materials. We’re proud of our work. Custom made art products specific to your application. Proud Member of the Greenville Chamber of Commerce. Wholesale Pricing for Designers. Give us a call!